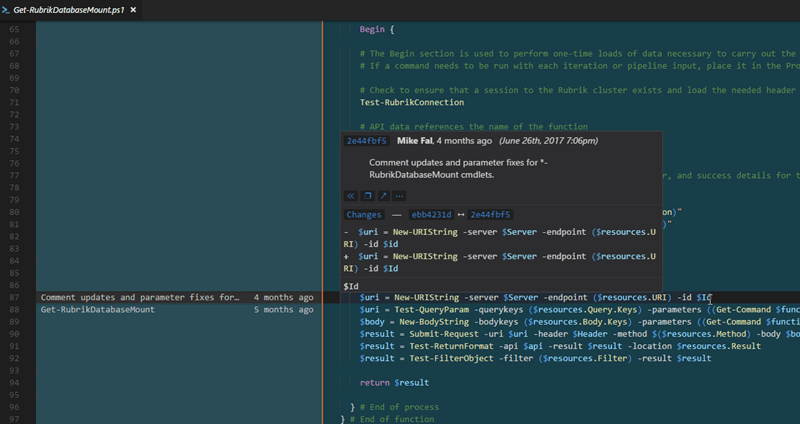 Those working with Visual Studio Code (VSCode) for their integrated development / scripting environments will likely notice the native Git integration that provides visibility and control over a local repository. While this integration is fairly solid on its own, the addition of Git Lens, an extension available in the marketplace, really enhances the user experience. I recently added the extension to my workstation to help with seeing blame, commit comparisons, and easily find the rationale behind a particular line or grouping of code. Git Lens makes it easy to see commits, messages, and changes. While it’s certainly possible to tease apart this information via the Source Control screen, it’s really handy to have it built directly into the file being edited. To install Git Lens, simply navigate to the Extensions panel and search for “git lens” to find and install the extension or visit the Git Lens marketplace page. Once installed, a quick reload window inside of VSCode will get you started. GitLens was unable to find Git. Please make sure Git is installed. Also ensure that Git is either in the PATH, or that 'gitlens.advanced.git' is pointed to its installed location. In Visual Studio Code, navigate to File > Preferences > Settings (or press Ctrl + , on PC). Enter the search string gitlens.advanced.git to find the git path configuration. Highlight the configuration line and click the “edit pencil” to copy the configuration over to your User Settings JSON file. You could also just add the line by hand, if desired. Enter the full path to your git.exe location. Make sure to escape the backslashes by using two of them. For example, my path is: "C:\\Users\\chris\\AppData\\Local\\GitHub\\PortableGit_f02737a78695063deace08e96d5042710d3e32db\\cmd\\git.exe"
With that done, save the User Settings configuration and perform a reload window. At this point the Git Lens documentation is your friend. In a nutshell: once you open a folder containing a git repository, all sorts of new details will bubble up. This includes blame annotations, recent change annotations, code lens (recent change and author details at the top of your code), new comparison tools, and a detailed navigation window. The integration is seamless and intuitive, becoming almost instinctive within a few minutes of working with versioned code files.